This entry level service has basic colours, minimal highlighting and basic basing. Your models will look great on the tabletop and are varnished to last. If you want your models to stand out on the battlefield then Superior Tabletop is the service for you. Features include Osl lighting, greater depth of highlighting, finer detail work and extra basing textures. The complete package for clients who like to take special care of their models and miniatures. With all the features of the previous packages, but with increased technical attention to detail, highlights, colour blending , base effects and terrain. Customisation is available to customer requirements which may include freehand work. 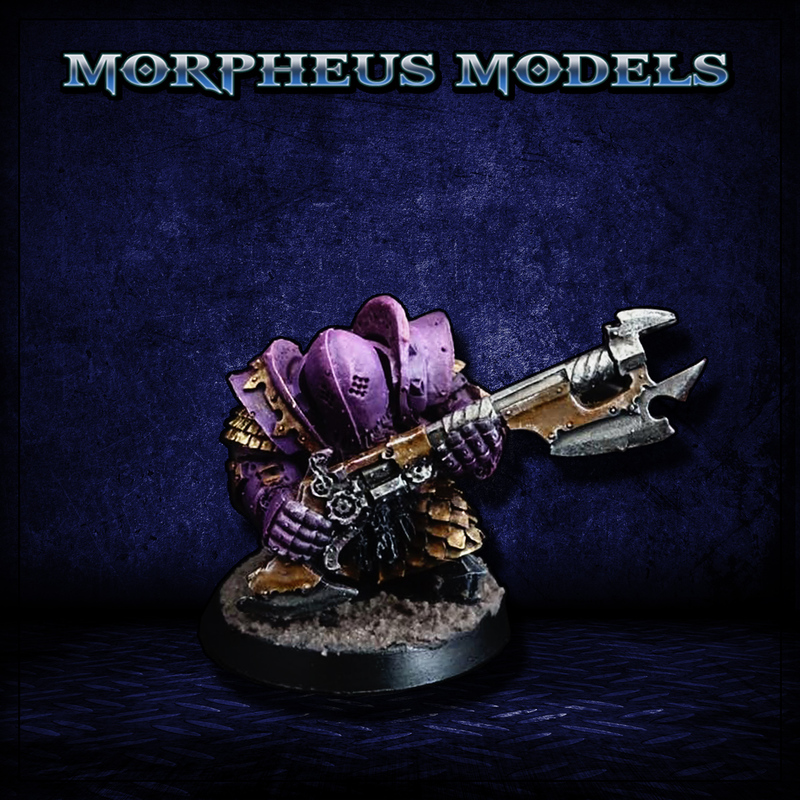 Magnetising weapons and parts, customising bases and models, custom colours and freehand work are all available as optional extras. Bespoke painting and custom base building service. All jobs require an advance 50% deposit which is non-refundable. Morpheus Models and Miniatures Design Process. There are a lot of factors to take into consideration when planning a tabletop army or large models. Colours schemes, equipment design, painting and basing are all important and we endeavour to go through these options with our clients so that the finished product is just as it was imagined. 1 – A complete colour scheme is planned out and discussed with the customer. 2 – The model is washed and cleaned to release any anti mould agent that may have been applied. 3 – We cut the parts from the plastic sprue, carefully removing any mould lines on the model. 4 – The kit is pre-assembled before painting to check the composition of limbs, weapons etc. 5 – A base coat and base layers are applied, basic colours painted on. 6 – Gloss varnish is applied to protect the colour underneath. 7 – We then start adding washes, this brings out the highlights and gives more depth to the model. 8 – Final highlight with OSL (object sourced light ) effects if needed, edge highlighting and final detail work applied. 9 – Base painting, texture and scenery is added. 10 – A final satin varnish coat is applied to protect the model from handling. By following this process we continue to produce quality paintwork in line with our customers requirements. We will send progress pictures as we paint the models to ensure our customers are happy and informed.